Climate Change is real, it’s caused by human actions and it is already causing damage. We’re keeping a log of major news stories reporting the consequences of global warming, including the death of species, melting ice, and reducing crop productivity. "Despite the severity of the problem and our enthusiasm for talking about it, we’re not yet taking meaningful actions"
Despite the severity of the problem and our enthusiasm for talking about it, we’re not yet taking meaningful actions. 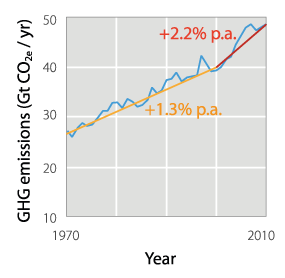 Global emissions are not just increasing annually, but the rate at which they’re increasing is itself increasing (Figure 1). In rich countries, like the UK, although we’ve taken some helpful actions our major response has been to try to shift the blame. On the positive side, we’ve continued the switch from coal to gas powered electricity generation started by Mrs Thatcher in the 1900s, and we’ve installed wind farms that generate approximately 9% of our total energy needs. But on the negative side, our Climate Change Act of 2008 commits us to reduce only the emissions on our own territory. As a country we’ve continued to grow richer since 1990, so we’re spending more and using more energy, but an increasing fraction of this occurs in other countries. The emissions caused by our purchasing are much greater than those released in our own country, and are not falling (Figure 2).